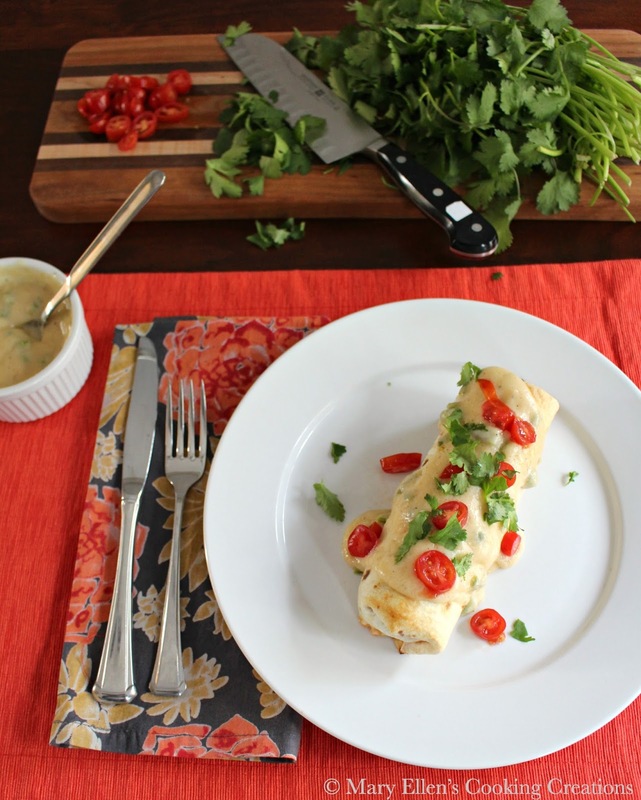 I love enchiladas and could probably eat them daily. The soft tortillas, different fillings, all smothered in a delicious sauce.. I think it's the sauce that gets me. 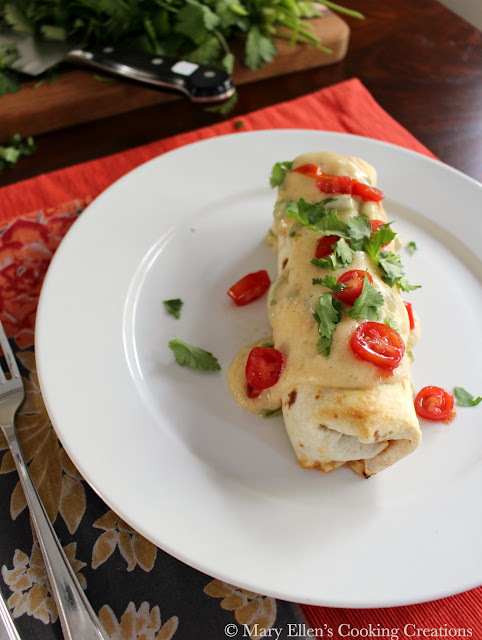 I'm not the biggest burrito fan because of the lack of sauce, so when I spotted a recipe for smothered burritos I was all over it. 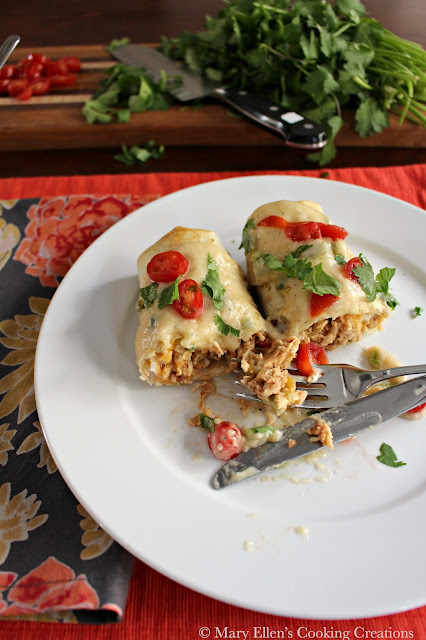 This recipe is SO easy because your chicken cooks in the crockpot all day, so it's really just making the sauce (which can be done in advance) and then assembling the burritos and baking them. This is definitely easy enough for a weeknight. The original recipe called for canned green chiles for the sauce, but I really prefer the smoky and fresh flavor from roasted jalapenos. The canned ones tend to be a bit tangy, in my opinion. If you have a gas cooktop it's really easy to roast your own jalapenos. Alternatively you could char them on an outdoor grill or even a fire pit. All you need is open flame. My advice - make extra!!! 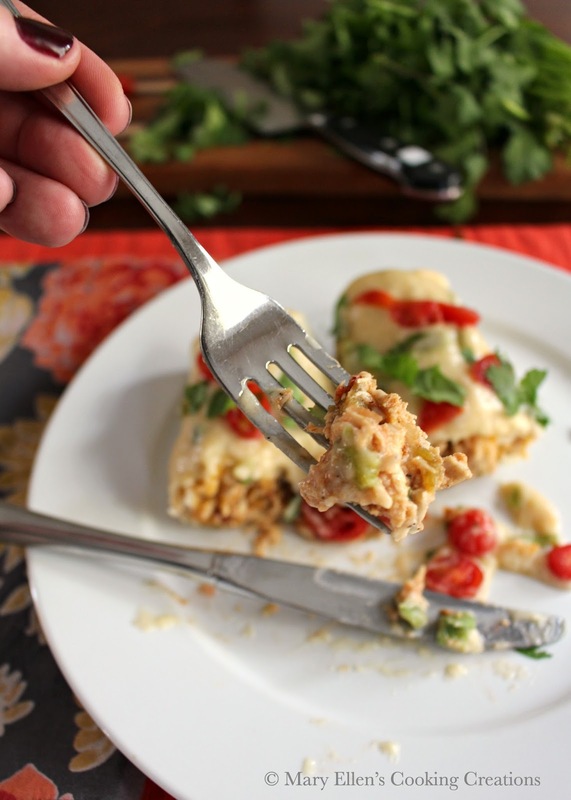 These were so, so good that I was so excited to have leftovers the next day. The chicken was so tender and flavorful. The tortillas were nicely crisped in the oven, and the sauce MADE these burritos. Smoky and full of a subtle heat, creamy, salty and just spoon-licking good. Seriously, I was licking the spoon. And leftover sauce is the perfect nacho topping! I will absolutely be adding these to my rotation... you should too! Cook on high 2-4 hours or low 6-7 hours until chicken is cooked through. Return chicken to the crockpot and keep warm until ready to assemble burritos. Roast your jalapenos - place the jalapenos over an open flame until all of the skin is completely charred. Transfer to a bowl and cover with plastic wrap. After 10-15 minutes, peel off the charred skin (you may want to wear gloves!). Cut off the top of each jalapeno and slice down one side to open the jalapeno flat. Scrape away the seeds and then chop the jalapenos. Heat olive oil and butter in a sauce pan. Lower the heat to medium and slowly whisk in the chicken broth and add the spices. Continue to stir for about 3 minutes. Remove from heat and stir in the chopped jalapenos, sour cream and cheese. Taste and add hot sauce if you want more heat. You can make this a day in advance and then slowly reheat it on low, stirring often, when you are ready to make your burritos. Line a cookie sheet with foil and top with cooling racks. Fill your burrito with chicken (drain the chicken from the liquid first, or just use tongs to pull out the chicken - you don't want liquid in your burrito), top with some cheese, and roll by folding in the sides and rolling as you continue to tuck in the sides. Place seam side down and spray with cooking spray (both sides). Cook on 400 degrees for 18-20 minutes. Turn on the broiler at the end to quickly crisp; flip burritos over and crisp other side. Serve topped with the warm sauce and toppings. The sauce sounds wonderful. I can't wait to try these!